I’m a pastor’s kid but I’m more than that, I’m the father of five pastor’s kids and that’s exactly why I was so intrigued by this book written by Pastor John Piper’s son Barnabas Piper called “Pastor’s Kid”! My wife and I had a bit of driving to do over the weekend so we plugged the iPod and spent the trip listening to this book! The first thing I noticed about the book is that John Piper wrote the foreword. As the father of the pastor’s kid who wrote this book it must have been a bit hard for him to read and it was! We listened to the audio version which is narrated by the author, Barnabas Piper, which is both good and bad. You could certainly hear some of the passion coming through in a few sections of the book that detail some painful times for Barnabas. However, there were other times when his reading was a bit dry but that’s understandable since he’s not really a professional reader. The book is written with Pastor’s families and churches in mind. It takes pastors and their churches to task for the often double standard that is held for the pastor’s kids. As I listened to the book there were times when I could hear a bit of cynicism coming through. It was obvious that Barnabas had been through a lot growing up as the son of a mega-church pastor! 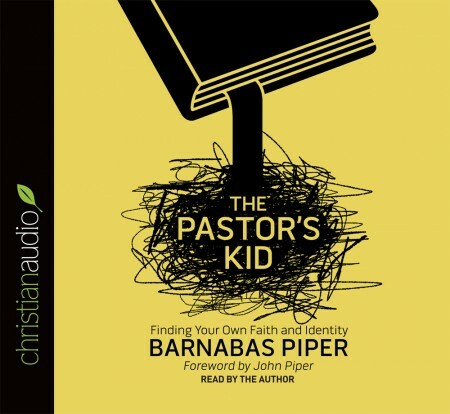 Most of the book deals with Barnabas’ personal experience but he does often quote other pastor’s kids as he comments on the problems of growing up in the pastor’s home. Despite Barnabas’ cynicism and taking churches to task for having one standard for the pastor’s kid and another standard for everyone else’s kids in the church, he strikes a theme of grace in chapter eight. I found this refreshing. He also offers some helpful advice on how pastors and churches should relate to pastor’s kids. Personally I found the book helpful for me to understand some of what I went through growing up and even more helpful as it gave me pause to stop and think about what my children might be going through right now and how I can graciously help them see Jesus in the midst of it all.